Harrogate Railway’s relegation from the NCEL Premier Division was confirmed on Saturday when they lost at home to Garforth Town. 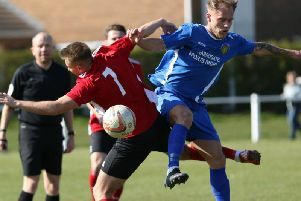 The Starbeck club were left staring down the barrel following back-to-back defeats last week, and needed to win their remaining two fixtures if they were to have any chance of survival. Yet their penultimate fixture of 2017/18 ended in a 2-0 reverse, leaving the Railwaymen with no chance of overhauling 19th-placed Hall Road Rangers, and condemning them to a second demotion is as many years. “I was pretty confident that I could keep the club up when I took over, but it wasn’t to be,” boss Marlon Adams reflected. “It’s easy to say now, and I guess we’ll never know for certain, but I think if I’d been here for the whole season then we would have finished higher up the table. “The club was in a terrible position when I got here with just six points from 17 games and we have seen an improvement. Our backs were against the wall, but at least we went down trying, the players didn’t lie down and give in. Railway fell behind at Station View just after the half-hour when an attempted header back to Dan Dekanski dropped for Callum Ward to lob over the stranded home custodian. Adams’ men then made the worst possible start to the second period, conceding within 10 seconds of the resumption as Mark Simpson was played through on goal and rolled home for 2-0. Worksop Town are the visitors to Station View for the Rail’s final game of the season on Monday evening, 7.45pm kick-off.